GMG pellet grills burn food-safe hardwood pellets for smoke and heat. A small amount of electrical power is needed to run the digital controller, fans, auger mechanism, and hot rod. From 65°-260°C (150°- 500°F) in 5° increments. 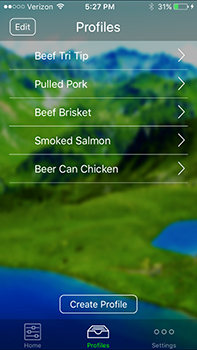 Easy monitoring and control of meat internal termperature. More cooking space than under a barrel lid (e.g. stand-up chicken/ large fowl/ rib racks). Stainless steel grates (950mm x 406mm / 40" x 16" / c. 3,857 sq cm). Heat shield and heat deflectors. Inside clearance: 343mm / 13.5". Upper rack for increased cooking area. Thermal blanket for added cold-weather insulation and year-round cooking. 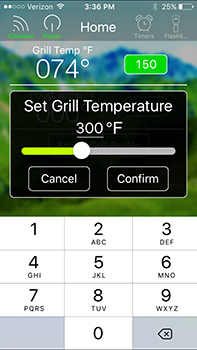 Control your Jim Bowie's temperature from 150°-500°F (65°-260°C) in 5° increments. Monitor and control grill temperature, meat probe/internal meat temperature. 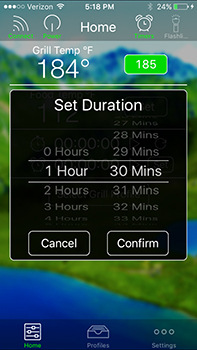 Toggle between °F and °C to follow your favourite receipes. 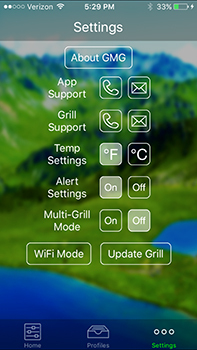 The GMG App can work in Point-to-Point (connect directly to the grill), WiFi (home network) and Server (connect while away from home) modes. Please note that GMG pellet grills supplied to the UK/EU do not show the "Daniel Boone" or "Jim Bowie" logo on the lid. 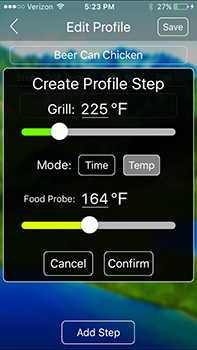 Green Mountain Grills LLC reserves the right to change product design and specifications without notice as part of its programme of continual product improvement. It is possible that the product(s) you recieve may differ from those shown on this website.